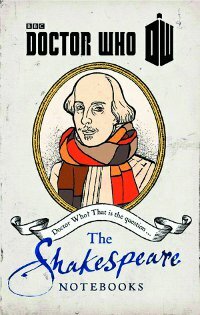 BBC Books recently published Doctor Who: The Shakespeare Notebooks. Newly discovered entries and drawings in William Shakespeare’s journals reveal for the first time the astounding relationship between the Bard of Avon and the Doctor! BBC Books has rediscovered notebooks, long thought lost, compiled by the Bard in which he divulges the influential role the Doctor played in his creative life. Here are the original notes for Hamlet, including a very different appearance by the ghost; early versions of great lines (“To reverse or not to reverse the polarity of the neutron flow”); the true story of how the faeries of A Midsummer Night’s Dream were first imagined; stage directions for plays adjusted to remove references to a mysterious blue box; and much, much more! I wasn’t quite sure what the book was going to be, even with a description like that. Was it going to be something like William Shakespeare’s Star Wars, a reworking of Doctor Who in a Shakespeare style? Or was it going to be like Arthur Phillips’ The Tragedy of Arthur, a collection of purportedly lost Shakespearean works that had a Doctor Who theme? Well, it’s somewhere in between. The Shakespeare Notebooks is like that. It’s a collection of outtakes and deleted scenes from Shakespeare’s work in which the Doctor or Doctor Who elements appear. The longest part of the book is “The True Tragedie of Macbeth,” a collection of deleted scenes from “Macbeth” in which the Doctor, Jamie, and Zoe appear and become involved in the tale. There are original (read: lost) works like “Ye Unearthly Childe” and “Master Faustus.” There are also rough drafts of some famous speeches to give them a Whovian flavor, rewritten sonnets, working notes, and the like. In short, it’s a Doctor Who anthology built around a Shakespeare theme, written in a Shakespearean or academic style, in which all of the Doctors (including the War Doctor) appear. Some of it is very anachronistic, like the prose account of the fifth Doctor, Shakespeare, and Richard Burbage. I’m not sure that the extracts are always written in iambic pentameter, nor am I sure that this works with “The Shakespeare Code” (which had its own set of chronological problems) or any other appearance by Shakespeare in Who. In the right frame of mind, though, I found myself nodding my head and going, “Yeah, I can see how this works.” It doesn’t seem to be a book you have to read straight through; the way it’s structured, you can dip in and out at leisure. It’s illustrated by Mike Collins, but the illustrations aren’t in the woodcut style used in the Shakespeare’s Star Wars books. There are five credited authors on this (James Goss, Jonathan Morris, Julian Richards, Justin Richards, and Matthew Sweet), and I’d like to know who wrote what. In terms of the pseudo-Shakespeare, I’d rank this below The Tragedy of Arthur and William Henry Ireland’s two plays (Vortigern and Rowena and Henry II, which I think are better than their historical reputation), on par with The Empire Striketh Back, and above Verily, A New Hope. (I’m not really a fan of the William Shakespeare’s Star Wars series; I find them very derivative, way anachronistic, and a bit too jokey, though the writing does get better as the series goes on.) It’s a bit of fun, really. Doctor Who: The Shakespeare Notebooks isn’t for everyone because it’s not really a traditional Doctor Who book. But it is fun, for those who have an interest in Shakespeare, and I’m glad to add this to my bookshelf.